St. Thomas’ men’s Volleyball team Bang Dem, created history on Saturday by becoming the first U.S. Virgin Islands team to participate in the history of the league—winning their two games in straight sets. 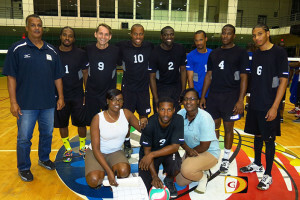 Bang Dem kicked off play with a 25-20, 25-23 and 25-22 victory over the Gunz. Alvaro deLugo IV had seven kills, four digs and two aces while Leon Smith followed with seven kills and Ted Fahie contributed six kills and two blocks. Paul Mourillon registered five kills, two blocks and three digs for Gunz with Trevor Burell adding three kills and four blocks. In their second match against Raw Power, Bang Dem walked off 3-0 winners, 25-17, 25-17 and 25-18. De Lugo had 11 kills, six digs and two blocks; Smith five kills and seven digs; Fahie 10, kills, one block and two aces while Marlon Richardson had 12 digs. In the second game, they approached it with a more serious attitude Thorp said and their coach asked them to do better. They also changed the lineup a bit he noted. The overall aim of playing in the league, Torp noted, is to build the national team and get to play in more international tournaments and possibly get into Olympic Games qualifying tournaments. Saturday night kicked off with the Jr. Women rolling over new comers Vixens, 3-0, 25-12, 25-18 and 25-11. Action kicked off on Friday night with defending women’s champs Phoenix Red a 3-1 winner over Raw Power, 25-21, 25-22, 24-26 and 25-16. In the men’s game, defending champs Just Dream beat Raw Power, 25-16, 25-17 and 27-25.